Lok Sabha is the lower house of the Indian Parliament comprising of 543 members (+2 *Nominated) who are elected directly by the eligible nationals of India every 5 years. The maximum strength of the Lok Sabha as envisaged by the Indian Constitution is 552, which is made up by election of upto 530 members to represent the States, upto 20 members to represent the Union Territories and not more than two members of the Anglo-Indian Community to be *nominated by the Hon'ble President, if, in her/his opinion, that community is not adequately represented in the House. Elections that are conducted in a credible way at regular prescribed intervals, are essential to the functioning of any democratic system. To conduct the elections, Article 324 of the Constitution of India bestows the relevant powers, duties and functions upon the Election Commission of India and Section 14 of the Representation of the People Act, 1951 provides the fundamentals of the letter and spirit of law to constitute a new Lok Sabha before the expiry of its current term. 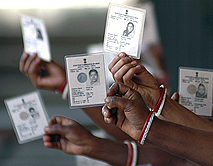 Factoring the Constitutional and legal provisions, the Election Commission of India has made comprehensive preparations for the conduct of elections to the 17th Lok Sabha in a free, fair and peaceful manner between 11 April 2019 through 19 May 2019, with 23 May being the date for announcing results. The Election Commission of India has always risen to successfully meet the challenge of conducting elections in the most populous democracy globally. Technology has been an enabler that has been aiding in the free and fair conduct of elections. With the current General Elections, the deployment of technology is set to see new highs with responsive websites, mobile apps, Electronic Voting Machines (EVMs) etc, all with the intent of making it easier for citizens to participate in the building of a great nation. Election Commission of India has a Systematic Voters' Education and Electoral Participation (SVEEP) program, to spread voter awareness and promote voter literacy in India so that with greater participation a stronger democracy may emerge. Voters may avail all services at the National Voters' Service Portal such as to locate their names in the electoral roll, apply for a new Voter Id, request a correction etc. Form 6 to Apply for Inclusion of Name in Electoral Roll for First time Voter OR on Shifting from One Constituency to Another Constituency. Every Polling Station is equipped with Assured Minimum Facilities (AMF) like drinking water, shed, toilet, ramp for the physically challenged voters and a standard voting compartment etc. cVIGIL provides the ability to send time stamped evidentiary proof of model code of conduct / Expenditure Violation, having live photo/video with auto location data. This unique combination of timestamping, live photo with auto location can be fairly relied upon by election machinery to navigate to the right spot and take prompt action. The GIS-based dashboard provides strong decision tool to drop and dispose of frivolous and unrelated cases even before they are acted upon, thereby reducing the workload of election machinery on ghost complaints.